Washington, DC – Ahead of the Supreme Court oral arguments in Trump vs. State of Hawaii – the lawsuit against President Trump’s long-promised Muslim Ban – Muslim Advocates released a report analyzing the effects and implications of the ban and the great lengths that the administration has taken to circumvent the Constitution. As the report outlines, in addition to vigorously defending the Muslim Ban in court, the administration has been hard at work behind the scenes to enact a web of policies and practices across a range of federal agencies, all with the goal of restricting the entry of Muslims into the country. 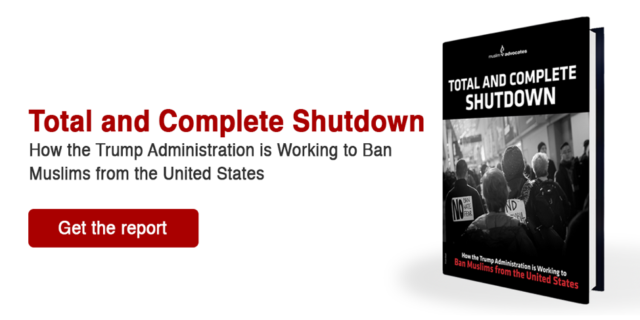 Creating such a toxic atmosphere that many Muslims—even those who do not come from one of the countries directly impacted by the Muslim Ban—are shut out or deterred from even trying to travel to the United States.